The Giver, a young adult novel published in 1993 by Lois Lowry, has become a classic work of dystopian fiction, beloved by young readers and adults alike. A tale of one boy’s fight against a restrictive government, it highlights the relationship of the individual to the collective and the light and dark sides of our capacity for free will. It provides a perfect platform for exploration of Jung’s psychological types, an illustration of the danger of one-sidedness. Exploring the interactions between the story’s young protagonist and the community he lives in, what emerges is a portrait of a tightly controlled society whose strict rules, fear of the past, (literal) lack of color, and emphasis on logical efficiency reveals a government that reflects ESTJ preferences. The protagonist, Jonas, is selected for a special role in the community as the keeper of all memories, both good and bad, of previous times and societies. With INFP preferences, the type code opposite to that of his community, he engages his dominant introverted feeling in rebelling against the rules and structure of his extraverted thinking dominant culture. The community in the story of The Giver is so significant it could be a character itself. This fictional society expresses a strong preference for extraverted thinking, which is therefore the community’s dominant or “superior function,” aligned with the archetypal role of the Hero (Beebe, 2005, p. 40). Jung (1921/1971) wrote that someone who relies primarily on extraverted thinking “elevates objective reality, or an objectively oriented intellectual formula, into the ruling principle not only for himself but for his whole environment” (para. 585). So, with extraverted thinking, structure based on intellectual postulates is of utmost importance, and there is little room for exceptions. This adherence to logical structure is played out in an extreme way in the world of The Giver as everything is tightly structured according to preordained principles of objective logical order: spouses are assigned by the community elders; each family unit is assigned two children, one boy and one girl, independently of their birth mothers; and occupation is determined top-down according to logical principles as children are assigned vocations that match their aptitude at the age of twelve (pp.124, 14-23). This highly structured ordering is characteristic of extraverted thinking (Te), as it “is driven to structure and organize the external world” and “sorts everything in the world to its proper place in an organized system” (Haas & Hunziker, 2011, p. 74). In short, extraverted thinking is about imposing order on the external world. The community of The Giver displays extraverted thinking in an extreme and concrete form, as order is imposed top-down, in accordance with abstract and predetermined principles of logic. Fundamental decisions about family and career are deemed too important to be left to the messiness of individual thought or feeling. We can also see that extraverted thinking dominates in this community by the sheer volume of rules. Extraverted thinking “views creating and maintaining systems that take care of people as more effective and therefore more important than taking care of individuals directly” and is therefore highly rule oriented (Haas & Hunziker, 2011, p. 74). Individuality is denied and suppressed for the smooth functioning of the whole. We can see this in how everything in the world of The Giver is governed by official rules, from social interactions to precisely when community members are allowed to leave their dwellings (Lowry, 1993, pp.17, 35, 198). These rules are no mere formalities either; the community takes them very seriously and will punish its members severely for deviances, even using capital punishment freely for violations of the law (p. 3). This tendency to take rules seriously is intrinsic to extraverted thinking which, in the dominant position, “tends to value rules and disallow exceptions” (McAlpine, Shumate, Evers, & Hughey, 2009). Indeed, this focus on rule-keeping can become extreme when this function is in the Hero position: “If inflated, may be unable to relax, feeling the need to constantly supervise” (McAlpine et al., 2009). According to the Function-Archetype Decoder, which describes how Beebe’s archetypes tend to manifest in the different types, any trait in the first position has this possibility of “becom[ing] inflated and lead[ing] to zealotry and hubris,” as it is the trait that is most often called upon and relied on (McAlpine et al., 2009). I would argue that the excessive totalitarian rules of the community offer a vivid demonstration of what an inflation of extraverted thinking in the dominant position can look like. There is evidence that the community has an auxiliary function of introverted sensing (Si) playing the archetypal role of the Parent (McAlpine et al., 2009), which would make it an ESTJ culture. Introverted sensing is important in the story as a whole as it is the function that focuses on memory more than any other, and “experiences the present world through comparison with previous experiences” (Haas & Hunziker, 2011, p. 44). Jonas’ assigned occupation as Receiver of Memory is deeply interwoven with introverted sensing, which “re-experiences the past sequentially in vivid sensory detail” (p. 44). As he begins his training, his mentor, “the Giver,” transmits memory to him through touch, causing Jonas to actually re-experience memories in a visceral way, feeling them in sensory detail as if they were happening all over again (Lowry, 1993, pp. 101-103). Indeed, Jonas’ position as Receiver of Memory provides us with a vivid way to understand what is meant by introverted sensing per se as it draws out the sensory aspect of memory. It is in the way the community has found it necessary to contain these memories in an individual that we can begin to see how the archetypal role of introverted sensing plays out for the community as a whole. Indeed, following John Beebe’s association of the auxiliary function with parental energy, the community’s relationship to memory shows that it does rely on introverted sensing in the Parent role. A hallmark of introverted sensing is “to use previous experience as a guide for exploring the current experience” (Haas & Hunziker, 2011, p. 44). Introverted sensing in this archetypal role “relies on the past to understand the present and to make decisions” and “often likes contributing to an existing organization by creating a secure environment” (McAlpine et al., 2009). So past experience is drawn on heavily for determining present and future action for this function in this role, often in the name of enhancing security. In the story, we see that the community’s elders have acted out the overprotective introverted sensing function in the Parent role by using the warfare, pestilence, greed, and pain of yesterday as reason to prevent modernity from experiencing anything at all (Lowry, 1993, pp. 140-142). While the function in this archetypal role often seeks to offer supportive guidance, in this instance the Parent has become smothering. Any function can get inflated, and when it falls in the Parental position, the function can be “overly protective” and “too directive” (McAlpine et al., 2009). That is certainly the case here. Indeed, the community’s decision to eliminate so much of human experience and confine all memories and emotion to one keeper provides a good example of the negative aspects of introverted sensing in the Parent role. Beebe’s model, as interpreted by the Function-Archetype Decoder, seems to almost anticipate the narrative action of the story, as it suggests that when using introverted sensing in the Parent role, one may be “aware of the emotions brought up by the recollections … [and] very careful about when to share,” trying to “avoid reliving emotions” (McAlpine et al., 2009). Remembered emotions, then, can be suppressed as dangerous by this function. Certainly we see this neurotic focus on safety playing out in the way the community has assigned a dedicated receiver to hold emotion and memory for the entire community. One of Beebe’s ego-dystonic “shadow” functions can be seen in extraverted sensing (Se) in the Witch or Senex role. This archetypal position, Beebe (2005) described as “coldly, arrogantly, judgmental,” tending to bring out the worst in all of us (p. 42). As extraverted sensing is all about the moment, experiencing life directly through the senses (Haas & Hunziker, 2011, p. 34), the regulation of this function seems to have gone haywire in this community that does not even allow color. The dynamic possibilities and vibrancy of the now are ignored in favor of strict adherence to a predetermined system of logic. Jung’s (1921/1971) writings on those with dominant extraverted thinking anticipates this rigidity in the shadow side of this type: “his moral code forbids him to tolerate exceptions; his ideal must under all circumstances be realized, for in his eyes it is the purest conceivable formulation of objective reality” (p. 347). According to the Function-Archetype Decoder, extraverted sensing in the Witch/Senex role, “may sharply criticize the physical appearance of another or focus on the superficial” (McAlpine et al., 2009). This principle of adherence to logically determined standards that can disregard compassion and human feeling is readily evident in the community. For example, identical twins are not acceptable because they may cause confusion, so they are weighed and the smaller of the two is killed (Lowry, 1993, pp. 185-187). Infants that fail to conform to behavioral standards by displaying excessive fussiness or other abnormalities may meet this fate as well (pp. 15-17). Extraverted sensing in the Witch/Senex role, then, can be seen both in the community’s lack of spontaneity in the present and in the disturbing attention it pays to superficial conformity no matter the cost. Truly, the inflated ESTJ personality seems to embody the strict authoritarian community well. Jonas exhibits INFP characteristics, displaying opposite type preferences to the ESTJ community in every dimension. This type’s dominant, introverted feeling (Fi), involves the process of weighing and judging according to feeling values. In Jung’s (1921/1971) words, introverted feeling “progressively emancipates itself from the object and creates for itself a freedom of action and conscience that is purely subjective, and may even renounce all traditional values” (para. 639). Jung’s words describe well the process by which introverted feeling is used to make value judgments, not according to collective standards, but according to a private inner compass that is difficult to articulate or explain rationally. Introverted feeling seems to be Jonas’ dominant function because it is what he draws on to throw off the collective moral standards of his time in favor of his own sense of right and wrong. Indeed, though Jonas increasingly objects to the community’s decision to eradicate color, pleasure, and individual choice, it is only when the community breaches a moral line that he is compelled to act in rebellion (Lowry, pp. 123-124). This line is crossed for Jonas when he learns that “release” really signifies euthanasia (pp. 188-191). When he learns that his father, a caretaker of newborn children, is going to “release” a newborn baby that has been living with his family, he takes the child and escapes on his bicycle (pp. 204-207). Here, Jonas’ reaction plays out Isabel Myers’ comment that “inner certainties and ideals” provide “direction, power, and purpose to the introverted feeling types” (Myers & Myers, 1995, p. 96). Indeed, the heroic action of the protagonist that works to drive the plot forward is clearly oriented around introverted feeling values. We can also see Jonas’ INFP nature coming out in the tertiary Si function, the Puer Aeternus function in the Beebe model. This is the role that is eternally childlike, and can be a source of great playfulness and charm; on the negative side, however, it remains somewhat undeveloped and is, in Beebe’s (2005) words, “inflated, vulnerable and chronically immature” (p. 40). I think we see this function playing out for Jonas in his relationship to the memories the Giver gives him. For example, the first memory the Giver provides him with is that of sledding down a hill covered with snow, a feature that no longer exists in this new world order (Lowry, 1995, pp.101-105). Jonas’ delight at receiving this and other pleasant memories seems to fit with the tendency of introverted sensing in the Eternal Child position to “be infinitely amused by recreating and living moments from the past” (McAlpine et al., 2009). Indeed, living through memory is one of the hallmarks of introverted sensing, and receiving the memories brings out Jonas’ playful and childlike side, but we also see the limiting aspect of this function’s archetypal role in Jonas’ reluctance to break from the traditions of his community. According to the Function-Archetype Decoder, this type may “hold onto traditions like a security blanket and be terrified of what would happen without them” (McAlpine et al., 2009) Throughout the story, we see Jonas having precisely this sort of frightened and childish reaction, as he clings to traditional aspects of his community even as reason and feeling is starting to tell him to question them. Change does not come easily for Jonas, and the sentimentalism of tradition is only broken for him when his introverted feeling values are violated. The shadow aspect of Jonas’ personality that shows up most clearly is his Trickster side. 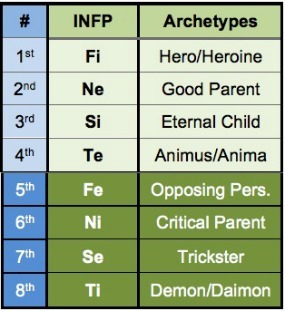 INFPs have extraverted sensing in the seventh or Trickster position, an archetype that tends to “reverse any expectation” (Beebe, 2005, p. 42). We see this tricksterish aspect appearing in a particularly interesting way in the story. While Jonas lives in a literally black and white world, the first thing that gives him an indication that the world is more than what it seems is that he starts to see glimpses of color. Color is a major hallmark of extraverted sensing, and those with this type in their dominant function tend to express a preference for vibrancy in art and dress (Haas & Hunziker, 2011, p. 34). Jonas first displays this “Capacity to See Beyond,” in the parlance of the book, as he starts to see the color red (Lowry, 1993, p. 79). He does not know what color is, or what red is; he only knows that a change of some sort has come over an apple (pp. 30). This is a perfect example of a function acting in a Trickster capacity—that is, because this archetypal position causes this function to be a “boundary crosser” and an “escape artist” that “manipulates freely to break rules” (McAlpine et al., 2009). Though the community has carefully engineered the suppression of color, when this function awakens in Jonas, it enables him to see color anyway. This is a good example of the way in which the unconscious Trickster can reach into conscious life and twist things for better or for worse. Jonas does not consciously choose to see red, and indeed, he could not make such a choice through an act of will. It is thrust upon him from the unconscious and precipitates his strange journey. What is particularly interesting to note is that, with opposite dominant functions (extraverted thinking for the community and introverted feeling for Jonas), their inferior functions are actually each other’s dominant function—that is, introverted feeling is the community’s inferior function, while extraverted thinking is Jonas’(McAlpine et al., 2009). This opposition plays out in the story in a particularly dramatic manner, and opens up to a broader discussion of the role that introverted feeling can play in a community. Of the conscious functions, the inferior function is typically the slowest to develop and always retains a primitive and archaic quality (von Franz, 2013, pp. 10-13). Despite its potential for embarrassing us, however, the inferior function serves an important archetypal role as it is the “bridge to the unconscious” (p. 10). Since it is impossible for us to consciously develop this function we must have “the humility to go down with one’s other functions to that lower level,” the realm that we are the least naturally skilled with (p. 22). Because of its link to our more archaic nature, it can help us “begin to recognize and explore” unconscious territory (McAlpine et al., 2009). The community and Jonas’ opposition of personality, then, creates a situation where the function that is strongest for the community (extraverted thinking) is what leads Jonas to his unconscious depths while Jonas’ strongest function (introverted feeling) will drag the unconscious up for his community. Indeed, this theoretical formulation does play out in the story and typology allows us to see the elegant symmetry that underlies the plot. The inferiority of Jonas’ extraverted thinking shows up in his inability to think through the logic of the rules of the community. Though he is both intelligent and academically inclined, his ability to question the logic of the values of his time remains undeveloped, in the way of the inferior function (von Franz, 2013, p.13). Indeed, the ability to think things through is sometimes difficult to access for this type, as they can become “overwhelmed by too many references and too many facts, so their inferior extraverted thinking sometimes just gets lost in a morass of details through which they can no longer find their way” (p. 60). We can see this confusion playing out in Jonas’ lack of ability to throw off the rules of his society with thinking alone. Indeed, as he absorbs so many memories, both beautiful and disturbing, his thinking process cannot discern whether it would be a positive or a negative if individuals were allowed to make choices (Lowry, 1993, pp. 123-125). Significantly, Jonas does not challenge the community on the strength of his thinking function at all. Only through a violation of the values of his dominant introverted feeling can he muster the heroic will and courage to act. This corresponds well to the theory that the inferior function cannot be developed, and could not support the type of consciously developed heroic action that characterizes the dominant function. We can also see how the inferior function bridged Jonas to the unconscious, both in an exterior and interior sense, as it was his appointment as Receiver of Memory by his extraverted thinking society that forced him down the staircase into the unconscious realm. They, needing him as part of their logical and well-ordered scheme, deliberately authorized him to disobey many rules in service to their mandate that he must bear the weight of the community’s enormous unconscious shadow (Lowry, 1993, pp. 86-87). In this way, he was pushed out of his tidy and organized conscious life, governed externally by rules, and forced into his inferior thinking, trying to make sense of things for himself. His community unknowingly precipitated an early and painful descent for Jonas, since it was by and through his relationship to the extraverted thinking function that Jonas was forced to confront the unconscious. As inferior extraverted thinking played a decisive role in Jonas’ story, so too inferior introverted feeling can be seen in the community. As von Franz (2013) wrote of the extraverted thinking type, “unconscious and undeveloped feeling is barbaric and absolute” (p. 50). We certainly see evidence of the barbarity of undeveloped feeling in some of the cruel policies of the community already discussed, such as the routine killing of its own citizens. But, what is particularly interesting here is how the story dramatizes the role of the inferior function as bridge to the unconscious. When Jonas finally decides to leave, he and the Giver discuss how the memories will come flooding back to the community; and the Giver himself says he will need to stay behind and help everyone sort through this material (Lowry, 1993, pp. 194-196). If we take the community’s unconscious to be in part represented by the great storehouse of memories that Jonas and the Giver contain, then we can see how this story makes vivid the more abstract archetypal role of bridging to the unconscious via the inferior function, as we imagine a community that has been so carefully sheltered from pain, violence, and feeling of any kind being suddenly flooded with a wild assortment of memories, both great and terrible. It creates for us an image of the unconscious unleashed, and a visually rich narrative of how frightening and potentially liberating unconscious material can be. The inferiority of Jonas’ extraverted thinking leaves him unable to question the rules; and his attempts to grapple with the prevailing Te logic pulls him down into the unconscious. At the same time, the community’s demand that he function as the Receiver of Memory, engaging his dominant introverted feeling, essentially puts Jonas himself in the position of carrying all the archetypal energies of the community’s inferior Fi Anima. So by doing his job well, he creates a gateway to his community’s unconscious. A Mirror of Our World? 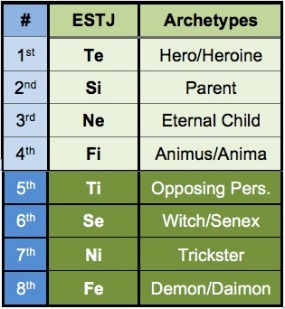 Exploring the typology of this fictional world provides an opportunity to see some aspects of our own society more clearly as, according to some typological theorists, the U.S. has ESTJ preferences as well (Giannini, 2004). Like the community in The Giver, our country also suffers from a critical undervaluing of the feeling function, a condition that can be seen in a wide variety of ways. One example is our tendency to slash the budget of values-focused disciplines such as education, humanities, and the arts while astronomically increasing other areas deemed more important, such as defense spending (Fang, 2013; Plumer, 2013). Our emphasis on capitalistic principles leads to a painful lack of culture that could be supported by a differentiated feeling function, as the increasing dominance of mega-corporations creates a homogeneous landscape of strip malls and fast food joints as familiar as it is ugly. What is perhaps most disturbing, however, is the recognition that some of our logic is just as cold as that portrayed in The Giver; after all, it is common knowledge that we live in a country with starving people and an abundance of food, with excellent health care that not everyone can afford, where there is a great concentration of wealth and yet many homeless citizens (“World Hunger,” 2015; Ehley, 2015; Johnson, 2015). Indeed, there are more examples of using logical principles of economics to justify preventable human suffering in this country than is comfortable to contemplate. We, like the community of The Giver, find ourselves engaging in practices that may make sense according to abstract logical standards but that do not respect the dignity of humanity or fulfill the needs of the soul. And as the fictional society bears resemblance to our own, so does depth psychology function in a similar way to Jonas, struggling against societal norms to hold onto deep feeling, consciously learning to hold pain. While The Giver’s society feels weirdly alien to us, there is also a curious feeling of recognition that may account for its continued resonance as a literary work for young adults. In particular, the community’s exclusion of the feeling function from participation in setting social priorities makes this work a dystopian mirror of our own culture. The book simply exaggerates a condition that we are already to some degree living. In the end, The Giver shows us how necessary the feeling function is in its unique ability to place value on things that logic holds to be unimportant. Beebe, J. (2005). Evolving the eight-function model. Association for Psychological Types Bulletin, Winter, 2005, 34-39. (Reprint 2006, Australian Psychological Type Review 8(1), 39-43. Brodwin, E. (2014, October 3). Ehley, B. (2015, January 16). 64 Million Americans Still Can’t Afford Medical Care. The Fiscal Times. Fang, M. (2013, August 5). Public schools slash arts education and turn to private funding. Thinkprogress.org. Giannini, J. (2004b). Our ESTJ national typology. In Compass of the soul (pp. 509-526). Gainesville, FL: Center for Applications of Psychological Type. Hillman, J. (2013). The feeling function. In Lectures on Jung’s typology. Dallas, TX: Spring Publications. Johnson, E. (2015, November 20). More than 500,000 people are homeless in the United States — a quarter of them are children. Rawstory.com. Jung, C. G. (1921/1971). General description of the types (R.F.C. Hull, Trans.). In H. Read et al. (Series Eds. ), The collected works of C. G. Jung (Vol. 6, pp. 330-407). Princeton, NJ: Princeton University Press. Lowry, L. (1993). The giver. New York, NY: Houghton Mifflin Harcourt. McAlpine, R., Shumate, C., Evers, A., & Hughey, D. (2009). The function-archetype decoder [Software program]. Louisville, KY: Type Resources. Hardwick, B. (2013, December 20). Plumer, B. (2013, January 7). America’s staggering defense budget, in charts. The Washington Post. von Franz, M.-L. (2013). The inferior function. In Lectures on Jung’s typology. Dallas, TX: Spring Publications. WorldHunger.org. (2015). 2015 World hunger and poverty facts and statistics. 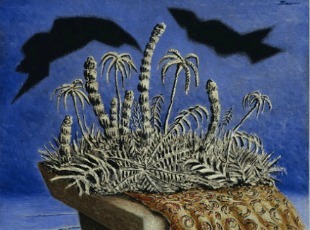 Alberto Savinio (Andrea de Chirico), “Portable Island” (1931). Galleria Civica di Arte Moderna e Contemporanea Torino. 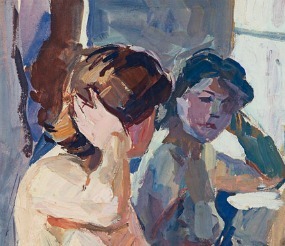 Alexander Schmidt, “Naked model in front of mirror” (1952). For me, one of the most compelling ideas here is that we cannot consciously choose certain things–our unconscious must “thrust” certain things upon us. Another is the idea that “fundamental decisions about family and career are deemed too important to be left to the messiness of individual thought or feeling.” A society where this is held to be true is a frightening one, indeed. Ashley Crawford graduated from U.C.-Santa Cruz with a B.A. 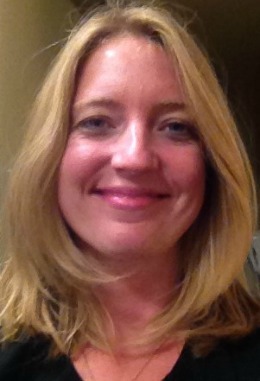 in Political Science and has completed requirements at Pacifica Graduate Institute for an M.A. in Depth Psychology with an emphasis in Jungian and Archetypal Studies. She worked as a paralegal for a criminal defense attorney, and is in the process of moving to Portland, OR, to become trained as a Marriage and Family Therapist.